Reborn Triumph’s 900 Trident was about as straightforward a bike as Hinckley could produce, and also happened to be one of the best of the early machines. The three-cylinder motor was distinctive, flexible and robust, the handling, though tall, better than the average roadster and it was comfortable, attractive enough and versatile, too. No wonder the Triumph Trident lived longer than most of the early bikes. The Triumph Trident 900’s ride was plush enough, but it’s handling set it apart, being a notch above typical bikes of this type of the time such as Kawasaki’s Zephyr, the Trident boasts decent brakes and suspension and steers sweetly, even if it is a tad top-heavy due to the spine frame. Like most of the early Hinckley Triumphs – which were all based around a modular construction system – the Trident was available in two capacities, in this case both triples. The short-stroke 750cc was cute enough, but it was the long stroke, 885cc 900 which was the one to go for and proved far more popular being grunty, fruity and versatile. It’s over-engineered, so is robust, too. Early Triumph Trident 900s suffered a little from thin paint, which was improved after the building of a new paint shop at Hinckley in 1993, but otherwise are fairly durable and reliable, especially if looked after which, being a Triumph, they tended to be. Fairly decent value when new, a good Trident today is going up in value. Buy the latest, lowest mileage version you can affrord and be prepared to shop around. 750s are cheaper than 900s, despite being virtually identical. 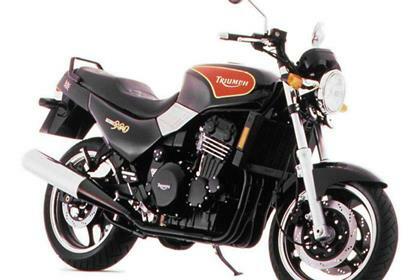 Find a Triumph Trident 900 for sale. 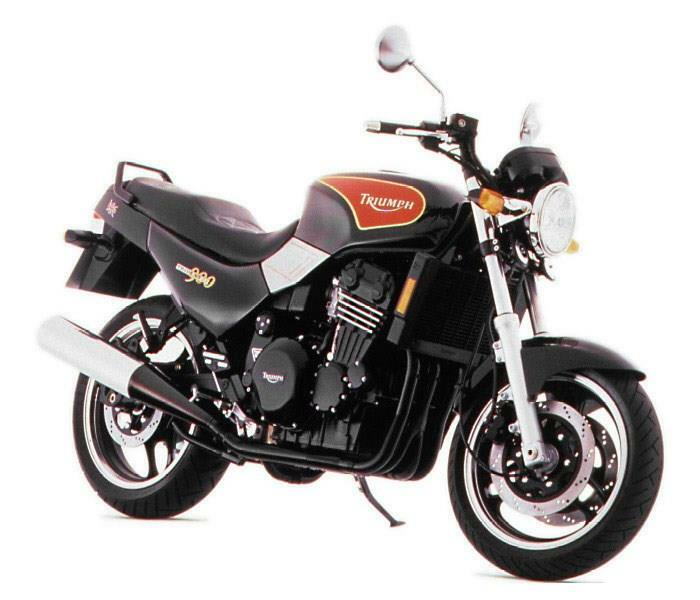 The Triumph Trident 900 was conceived as a fairly basic, affordable machine and the basic specification reflects that. It’s not exactly lacking, but nor is there anything extra or flash about it either. 1998: 900 and 750 Tridents deleted. 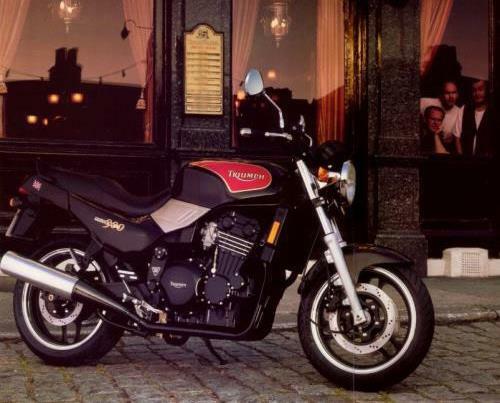 11 owners have reviewed their TRIUMPH TRIDENT 900 (1991-1998) and rated it in a number of areas. Read what they have to say and what they like and dislike about the bike below. had mine (sprint) since new. super build quality and the engine is priceless. a little top heavy which stops it getting five stars. Very reliable. At 35k replaced the ignition coils and pick up coil - as it was cutting out when hot and otherwise running poorly. other than that just the usual consumables ie pads and tyres. So far have avoided the common sprag clutch problem by keeping the battery charged and in tip top condition. wont be selling it other than as part exchange for another triumph at some point. over engineered, slightly top heavy but superb engine, build quality and ride - had mine from new and always puts a smile on my face. 35k miles, no major problems. Used to ride plastic sowing machine jap bikes - not any more. selling mine ? (not a chance). Just bought a 93 trident sprint 900 for less than a grand, 37k two owners, what a fantastic old bike, starts on the button, rides and handles great, excellent bike for winter rides, I am made up with it, I also own a Thunderbird 900 sport, witch is a retro trident, lovely bike to own, classic retro looks with modern manners, would recommend to anyone, I have had triumphs for some years now modern ones are very good, but for me they are a bit on the hard and fast side. Had a sprint st 1050 2007, great bike but more sport than tourer, Whereas the 900 is more tourer than sport, witch suits me better. The sprint 900 is a great all round bike, little on the heavy side but not as bad as a 1200 bandit, and not a problem if you are a tall or larger rider, I am 6 foot and will need to change the screen to a higher one, as i get a little head bashing at higher speed, No other complaints, triple motor is fantastic, cant stand screaming fours, fuel eon good, very cheap insurance, both my bikes get lots of attention at the local cafe, i think because they stand out now from the crowd, So peeps, don,t go and spend 10k on a shiny new bike, fill your garage up with some modern British classics , you won't regret it and you certainly will not loose money, after all all these bikes are about as cheep as they will ever get, The only way is up if you look after it. Just a brilliant back to basics bike. There a very few bikes to match the Trident for reliability and ease of ownership. I'm a mechanical numpty but a Haynes manual and a sunny day is all you need for this bike. Its engine is superb, very flexible and powerful, the ride is stable although the suspension is a little wallowy (mind you my suspension is getting on a bit, may be time to upgrade), the seat is all day comfy, the pillion seat is also very spacious and comfy and the tank range excellent. It's also a bike designed for a normal sized brit so it fits a 6 footer like me a lot better than similar japanese bikes I tried. You can get one of these for £1500 and it's one the best buys you could ask for! WOW! Where have you been all my motorcycling life? I was bored with all the 'plastic fantastics' and yearned for a proper motor bike. 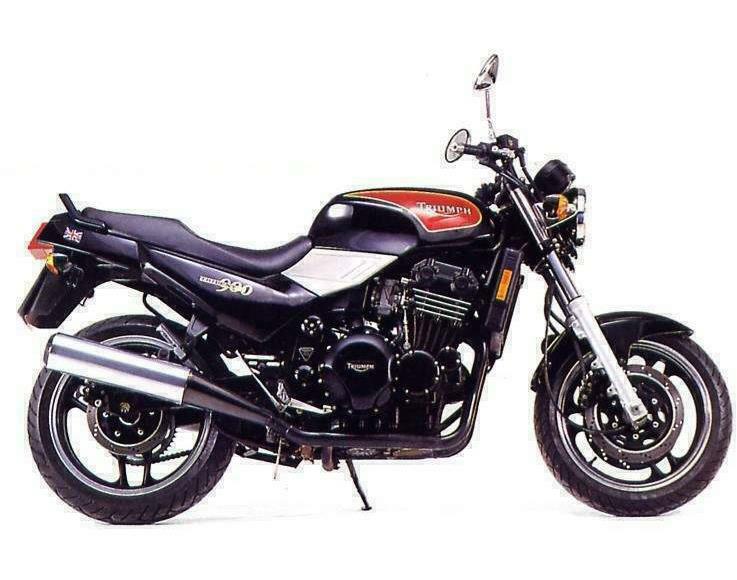 I had never considered Triumph before and had gone through a succession of Honda's and Suzuki's (Fireblade, SV650, DRZ400, VFR800, TDM800, TTR250, CB750, CX500, CRF250 etc. I found this Trident on ebay and could not believe the condition it was in even after 18 years it looked as though it had just come out the showroom. The bike gleams and looks fantastic! The engine has six gears (why?) five is more than enough. It is as sweet as a nut. It rides and feels like I'am on a proper bike again, and the grin factor is back. I don't speed everywhere, I ride to enjoy myself and safety is always upper most in my mind having lost several close friends to motorcycling accidents. This bike has done 24,000 and the alternator bolt had sheared when I bought it unknown to me at the time but only cost £86.00 to repair at BS Bikes in Tunstall. I am worried that the sprag clutch may go but if it does it does. The finish on these bikes is the best that I have ever seen and its so cheap to insure (£76.00 with Bennetts), I love the upright riding position it must be an age thing being 52 now I can ride upto 2 hours without a break in relative comfort on this bike. The mirror stems and the underside of the head light chrome ring are showing signs of slight surface rust on close inspection and the right hand engine cover starts to bubble due to the powder coating issue. Other than these minor points the bike is perfect. The acceleration is something else, it's a Fazer 1000 but with pedigree and breeding, just have to re-learn how to take corners all over again and one day I might be able to put this bike onto its centre stand...lol this is a man's bike alright. It turns heads everywhere I go in its British Racing Green and Cream livery and everyone comments about its good looks. A great bike for very little money...highly recommend you look one up if you are yearning for something different. Had my 750 Trident (98) model for 3 months, bought with FSH and well looked after, it has served me well so far (every day use) niggles are, normal pipe removel is a must!!! Shh!. it's a bit bouncy on the road, but that's it really. 200mpg and easy 2 throw around - for a heavy bike, 1st Triumph, so happy so far, last of the Brit Bikes. Bought my Trident new in August 1995.Still have it to this day with now over 45000 miles under its wheels.Beautiful strong,smoothe and torquey motor which is more than capable of hauling 2 people plus luggage over long distances.Have done over 500 miles in one day through France with minimal discomfort for myself or my wife. Handling is a bit top heavy, especially when fully loaded (Givi panniers and top box plus tank bag) for 2 up touring,but even so can still be hustled through corners quite nicely. I've had no reliability problems at all so far,just normal service replacements. Fully loaded at 80-85mph on French autoroutes I can usually get 155 to 175 miles before the fuel warning light comes on, so fuel range is pretty good. It is run on 10/50 or 15/50 fully synthetic oil which is changed every year. Tyres at the moment are Avon Storms which seem to suit it well and gave 7000 miles at the rear and over 8000 at the front (and still counting). Goodridge hoses and EBC HH pads give pretty good braking. Hagon shock and front springs help the handling and a Gpz style handlebar fairing helps keep the wind off. Overall a very strong reliable bike which will go to the shops or the depths of France with minimal fuss or effort. And all with a beautiful 3 cylinder soundtrack. Don't think I'll ever sell it. Couldn't get anything as good for the money so why bother? Seller says "Very good clean condition. Just serviced new battery. 4 into 1 Remus full Remus system.